Character sheets are mostly all the same—some are prettier than others, but they pretty much do the same job. A small number manage to make it harder to play the game, by being poorly organized or focusing on the wrong information, but most are just fine. But a small number of character sheets go beyond being just an organized list of character stats. 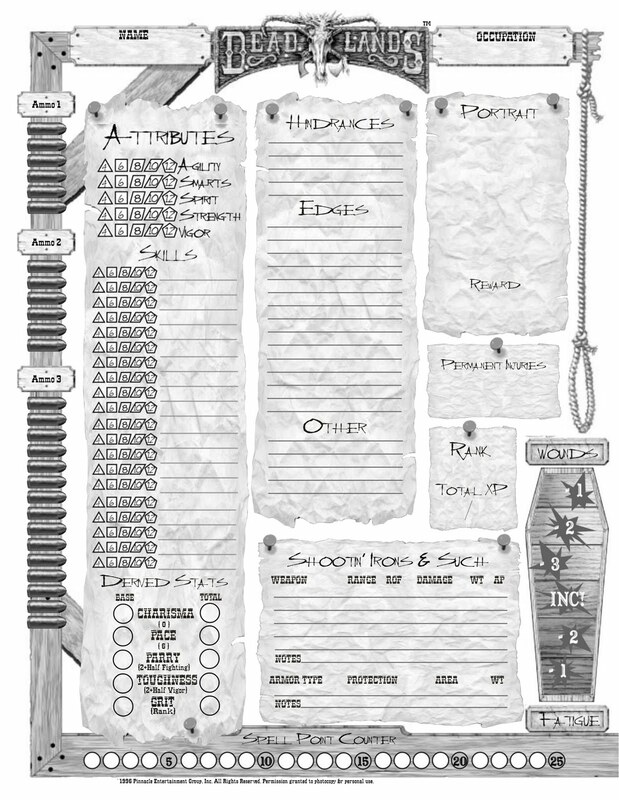 The original Deadlands character sheet has the wound track up one side, marked by bullets, so that you can slide a paperclip along it to track how injured your character was. Fireborn has large boxes for your main stats, which are dice pools, so that you can set the dice on the character sheet and move them around as they are allocated. Dungeon World’s “playbook” combines character sheet, character generation rules, and all the rules you’ll need to advance your character throughout the game. The character sheet for the original edition of Immortal: The Invisible War helps you track the many ever-changing “halos” of your character. There are many others that I’m not immediately thinking of. But probably the best character sheet—both well designed and with excellent functionality—is the one for Eoris: Essence. Well, there’s “still play”, and then there’s “still play”. The oldest published RPG I have played recently is probably The Shadow of Yesterday (we’re playing it now). I also regularly return to Primetime Adventures, though it’s been a couple years since we last played it. And Primetime Adventures is pretty much my go-to game when I don’t have some other game specifically in mind, so I’m sure I’ll play it again some time soon. And then there are several older games that I would play at the drop of a hat, but it’s been many years since I last have: Ars Magica, Werewolf: the Apocalypse, Underground, The Babylon Project, Everway, Fading Suns, Deadlands (the original), or Over the Edge. I still buy all the Ars Magica supplements as they come out, and try to find time to read them. The oldest published game I actually have played semi-recently is Rolemaster: I played for a bit about 4 years ago with a group that is still playing the original edition, 30 years later. But I don’t really think it’s fair to say that I “still” play or read it—I haven’t touched it since then, didn’t read any of the books at the time, and before that group I had last looked at a Rolemaster book in about ’85. The only games older than The Shadow of Yesterday that I’ve both recently played and intend to play again in the future would be my own Four Colors al Fresco, created in 1999, released as a free beta PDF around 2004, but not yet properly published. It will be this fall/winter, if I can make the time between school and work. “Favorite RPG I never get to play” is a tricky question. Is that literal, or figurative? My reflex answer to this is Ars Magica or Over the Edge, but both of those I have played on multiple occasions. 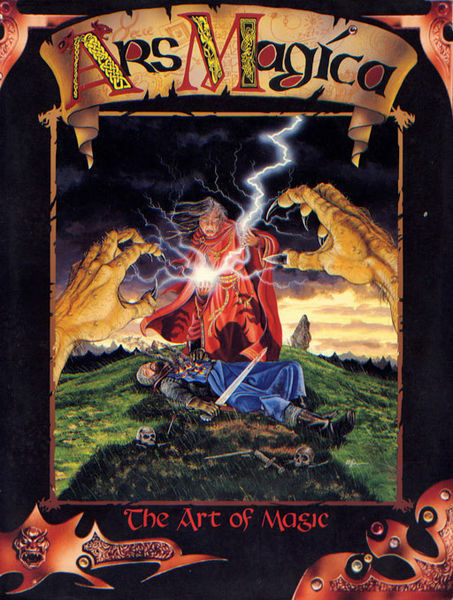 So while it feels like I “never” get to play them, I actually have—in the case of Ars Magica I’ve had 2 or 3 long-running, awesome games over the years (one using Redhurst as the setting). A few other games that I’ve “always wanted to play”, I’ve actually played, if only once: SkyRealms of Jorune, Time & Temp, Earthdawn, Iron Heroes, Doctor Who: Adventures in Time and Space, Cat, Everway, Aria: Canticle of the Monomyth. I’d love to play any of them again, with Iron Heroes and Everway tops on the list. But they can no longer go on the list of games I’ve never gotten to play. If I take the question absolutely literally—only games that I have never played at all—there’s still quite a list. Deadlands and The Babylon Project are very high on that list, as are Don’t Rest Your Head, Castle Falkenstein, and Dead Inside. Particularly notable is Deadlands: we created characters when the game was new, and then the game fell through before the first session. 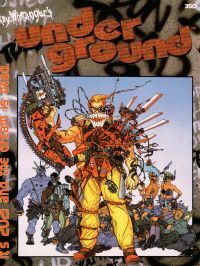 But of games that I’ve never gotten to play, I guess I’d have to say that Underground is the never-played game that I most want to play. It beats out the others by virtue of its genre and mechanics. The unique blend of dystopia, cyberpunk, and supers, used to foment social commentary, is something I’ve not found even half of in any other game. The mechanics are not as novel as some games, but still provide some nice touches. I’m particularly fond of the character creation, which puts the player in an impossible situation that mimics the impossible situation their characters are in, and the rules for how characters’ actions change society, always with unintended consequences—I believe Underground was the first commercial RPG to have formal mechanics for this.